To describe BS Johnson as a writer of books sounds like a mistake—a casual, and perhaps lazy piece of misinformation. True, Bryan Stanley Johnson wrote almost exclusively about his own life, but the word ‘writing’ seems to limit the horizon of Johnson’s project. Maybe, then, it is better to say BS Johnson worked with books. The book form, after all, comprises and connects all that Johnson attempted to grapple with: words, pages, printing, subject matter. Thus the substance of Johnson’s project exists somewhere between the printed page and the reader’s eye, between linguistic and visual translation, or, to sum up neatly using a phrase borrowed from Robert Smithson’s 1967 show, Johnson’s novels comprise language to be looked at and/or things to be read. The page, Johnson declared, ‘is an area on which I may place any signs I consider to communicate most nearly what I have to convey: therefore I employ, within the pocket of my publisher and the patience of my printer, typographical techniques beyond the arbitrary and constricting limits of the conventional novel.’ Language and image are not differentiated here; they are levelled to share a common context. Johnson’s project, then, was to communicate content ‘most nearly’, in the most suitable form possible. And if such a form was not already existent, then the content demanded that Johnson should make one suis generis . Smithson’s 1967 exhibition Language to be Looked at and/or Things to be Read (the press release written by the artist under the pseudonym Eton Corrasable) remarks on the apparent decline of the book form: ‘Books entomb words in a synthetic rigor mortis, perhaps that is why “print” is thought to have entered obsolescence. The mind of this death, however, is unrelentingly awake.’ While Smithson was melodramatically casting the book as a crypt encasing a literary zombie (his tone indicative of how much was at stake with the use or misuse of language), Johnson was at work on his third novel, his most notorious: The Unfortunates . Presented in a box containing 27 loose sections or ‘signatures’ that could be shuffled and read in whichever order the reader so chooses, The Unfortunates can be seen as Johnson’s revenge against the ‘rigor mortis ’ of the bound page. Inspired by the loss of his close friend Tony Tillinghast to cancer, the story is an interior monologue of a reporter sent to cover a football match but ﬁnds himself reﬂecting on the death of an old friend. 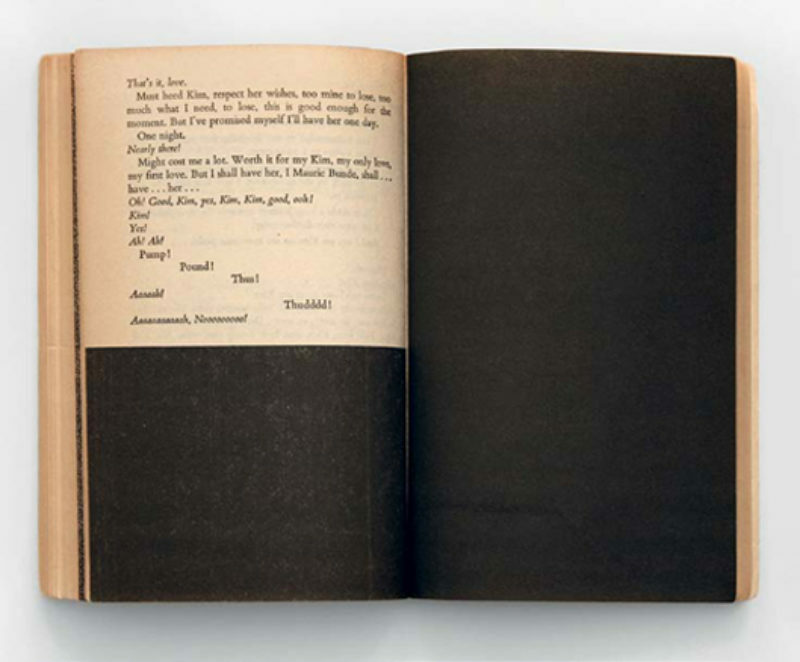 The text serves as a ‘transcript’ that mirrors the aleatory movements of the mind over a period of 24 hours, and the book is presented both as a technological object and a physical metaphor for randomness where, as Johnson notes, ‘the past and present [run] together in a quite arbitrary manner’. The ‘shuffle’ format of The Unfortunates, 1969, was not entirely a new phenomenon of course. But to talk only of the form by comparison is to ignore the content of Johnson’s The Unfortunates —one of the book’s strongest features. The story, for want of a better word, possesses a shocking emotional charge, which makes the format appear less of a playful or experimental act, and more of a necessary function that atomises an interior monologue that spirals the narrator’s irreconcilable grief. Johnson uses one form (a journalist reporting a football match) to discuss that of another (death and dying), and the chaotic nature of events and their unfolding is twinned with the physical randomness of the book itself. The novel renders a darting, polyattentive consciousness hinged on the three principles that Johnson held dear: ‘the precise use of language, exploitation of the techno logical fact of the book, the explication of thought.’ While it’s highly unlikely that Johnson was ever aware of the conceptual strategies of artists such as Smithson, Mac Low, or a host of artists who were interrogating the materiality of language at the same time as his novels, there is something nonetheless illuminating about discussing them in tandem with Johnson’s. It’s worth noting, for instance, that simultaneous to the writing of The Unfortunates, Andy Warhol was ﬁnalising a: A Novel, a publication that distilled two-years’ worth of conversations with Factory icon Ondine, into a 24-hour period. The form of A Novel is rambling, often incoherent, salacious and frank, and has little textually in common with Johnson’s crisp prose. But as a roman à clef, the ambitions of Warhol’s novel are surprisingly close to Johnson’s own output: a thinly veiled reﬂection of life experiences barely ﬁctionalised, an ontological authenticity. ‘Telling stories,’ as Johnson was at pains to point out throughout his career, ‘is telling lies.’ And, as critic Thomas Crow suggests, Warhol had his own brand of traditional American truth-telling, where A Novel is the quiddity of the artist’s project. Within his contemporary British literary context, however, Johnson’s use of formal devices (only where, he would argue, the content demanded its deployment) was frequently dismissed as gimmicky. Writer Gordon Williams, for instance, called out Johnson’s use of Tristram Shandy -inspired black pages in the latter’s 1963 novel Travelling People . Williams suggested that Johnson’s black pages were the ultimate act of ‘anti-language’—not the stuff of a writer. Yet for every rule there is an exception, particularly, it seems, in the case of Johnson, and one of his later books does exemplify a rare instance where the writer stepped into the imagined consciousness of other people, rather than rely on his own lived experience. House Mother Normal, 1971, revisits The Unfortunates ’ themes of frailty and dying, but refracts his concerns through the interior monologues of ten elderly residents of an old people’s home. Each section circles a single event, and together build a polyglot narrative that swells into an irrepressible chorus. House Mother Normal, with its fragmented form and disintegrating language is, among many things, a lament against the society’s aversion to old age, and Johnson elevates the otherwise marginalised voice of the elderly. Over the past decade Johnson’s work has been on a slow-burn rise, thanks to Jonathan Coe’s excellent biography A Fiery Elephant, 2004, but also due to the sustained interest of artists and graphic designers such as Bailey, Will Holder and, more recently, Beatrice Gibson. House Mother Normal served as the formal starting point for Gibson’s ‘The Future’s Getting Old Like the Rest of Us’, 2010, a ﬁlm made in collaboration with writer George Clark. Over a period of six months, Gibson and Clark conducted interviews with care home patients living in Camden, speciﬁcally meeting with elderly patients exhibiting early signs of dementia. Transcribing the interviews and producing a carefully designed score (Gibson clearly deﬁnes the form as such, rather than a script), the ﬁlm exists as an elegy for memory inﬂected with the urgency of the present. Gibson notes that when she and Clark put the score on the wall, ‘it was the ﬁrst time we were able to see/hear/imagine what the ﬁlm would sound like. The density of the score’s columns indicates how many voices are speaking, so it was the ﬁrst time that we edited according to sound and not according to sense or semantics. We wanted a kind of musical logic.’ Given Johnson’s care for the visual aspects of the book form, Gibson’s cinematic rendering inﬂected with a musical approach is a seemingly logical extension of his legacy—one that casts language not as a primary constituent but a contingent factor among a panoply of visual and aural devices. Johnson’s maverick status as a writer is less isolated (although no less ambitious) when contextualised within the visual arts of his time. His methods and ideas coalesce with early conceptual art practices that grappled with the materiality and form of language. The strategies employed by the aforementioned artists share a kinship with John- son’s self-consciously critical operation and the disassembly of traditional apparatus. His books need to be looked at, not simply read. 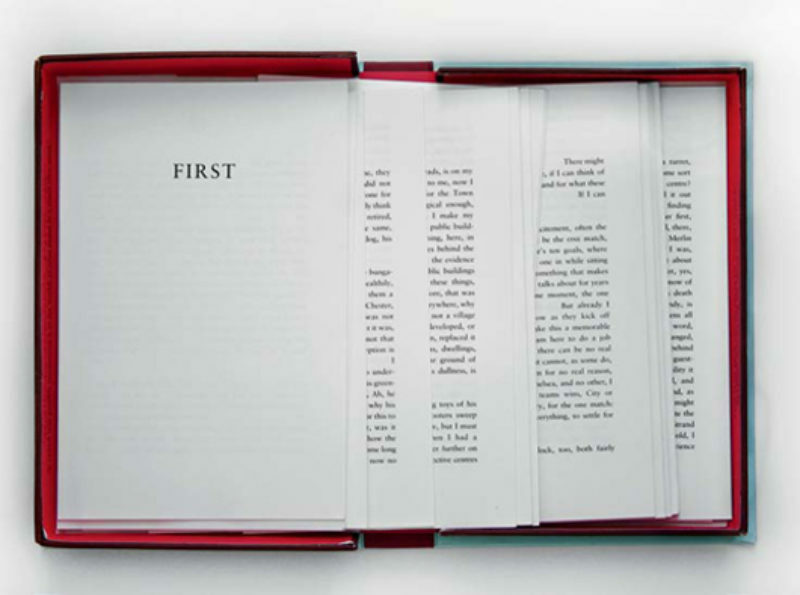 And, with a rare acknowledgement of the book as a technological object, Johnson’s project inserted the architecture of the book form into a conceptual ﬁeld. Footnote amendment (21 Jan 2016): Isla Leaver-Yap is currently Director at LUX Scotland and was appointed the inaugural Bentson Visiting Film Scholar at the Walker Art Centre in 2014.